What is being marked as historic and momentous in First Nations education, is the creation of an urban reserve in Regina. 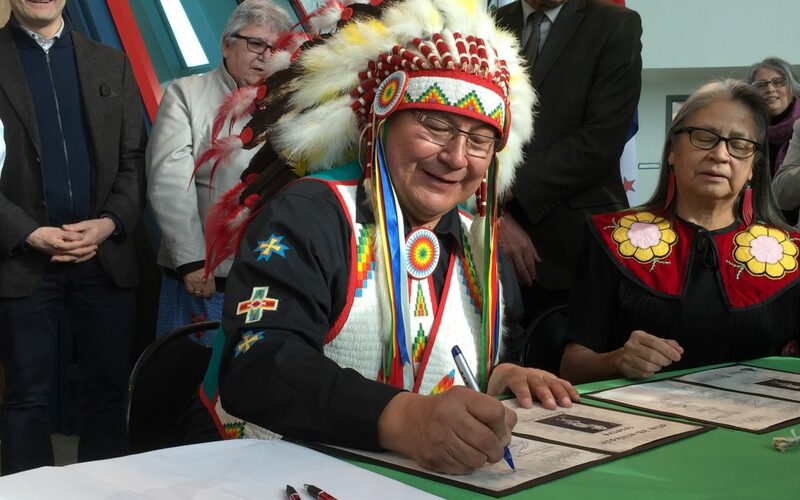 The Star Blanket Cree Nation and the First Nations University of Canada signed an agreement Wednesday, designating 32 acres of land surrounding the campus as Atim kâ-mihkosit, which translates from Cree to English as Red Dog. “The joy of our people, seeing them being here, to see the joy on their faces when we did the ceremony felt a sense of accomplishment for all of our nations,” Star Blanket Cree Nation Chief Michael Starr said. In 2002, Star Blanket began the process of creating the urban reserve, finally being formally recognized in September 2018. “We need to carry on into the future. And connecting the Treaty Right to education, right now it has to be part of it,” explained Starr. “An Indigenous university that is run by Indigenous People as well and now to have it on reserve land it means a lot to people. I was just speaking to a woman who was one of the first students here in 1977, this is a big day for her, a big day for a lot of people,” said Indigenous Services Minister Seamus O’Regan.